Toka Kahn Clary is continuing to put the featherweight division on notice. The southpaw fighter outpointed Emmanuel Dominguez over 10 rounds, winning a unanimous decision Saturday night at Boardwalk Hall in Atlantic City, N.J.
Dominguez did his best early on to close the distance between himself and Clary, connecting with overhand and lead right hands to the head. But Clary's pedigree and skill-set were too much for the fighter from Aguascalientes, Mexico, and it showed during the second half of the fight. Clary (25-1, 17 knockouts) connected with several left hands to the head, but Dominguez's chin held up. Despite being down late in the fight, Dominguez continued to apply pressure, but Clary clearly won the final couple of rounds. Scores were 98-92, 98-92, and 96-93 for Clary. Clary was fighting for the first time under Freddie Roach. The Providence, Rhode Islands resident has won his last six bouts and is ranked number 11 by the WBA. Dominguez drops to 22-7-2, 14 KOs. 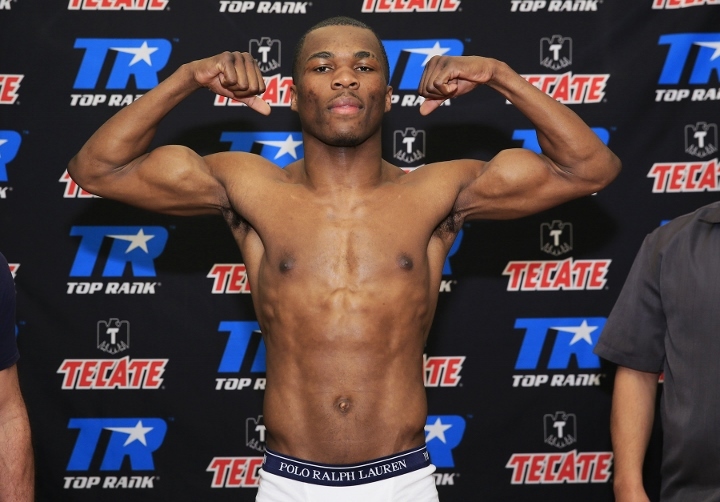 Former amateur standout and welterweight prospect Poindexter Knight won a four round unanimous decision over Juan Carlos Sepulveda (0-1-1). Scores were 40-36, 40-46, and 39-37 in favor of Knight, who improves to 4-0, 2 KOs. In the fight of the night, bantamweight Alejandro Jimenez (2-0, 1 KO) won a hard-fought four round unanimous decision over Dallas Holden (1-3). Both fighters went down once in round three, but Jimenez sealed the win in the final round by dropping Holden to the canvas. Scores were 39-35, 39-35, and 40-34 in favor of Jimenez. Junior welterweight Greg Outlaw (5-0, 2 KOs) stopped Dan Murray (3-2 1 ND) at 1:47 of the second round. Cruiserweight Alexey Egorov (5-0, 4 KOs) stopped Luther Smith (10-4, 9 KOs) in the opening round of a scheduled 10 round bout.